A large number of Bangladesh population living under poverty line often face crises because of severity and recurrence of natural disasters. These multiply the miseries of the poor communities with the loss of their modest assets and property. The victims of such crises are in need of some immediate material help. A good number of organizations and individuals, during the time of such crises, approach Palli Karma-Sahayak Foundation (PKSF) for special financial assistance to address their immediate needs. Having no provision in its mainstream programmes to respond these needs, PKSF, with the intention to serve humanity, has formed a Special Fund from its own resources in 2010. PKSF generally provides special assistance from this fund to the victims of unforeseen adversities and natural disasters such as cyclone, tornado, flood, drought, epidemic, earthquake, severe winter etc. The special fund has been created to address such situations with the limited resources of PKSF. The programmes/projects participants of PKSF including PKSF and POs (Partner Organizations) staff suffering from crises beyond their individual and family means can get support from the Special Fund. It also tries to facilitate various social services for the community such as provision of safe drinking water, health, education etc. in the remotest areas of the country. The helpless and ailing freedom fighters, teachers, persons with the background of commitment to the social welfare are also eligible to get support from the Special Fund of PKSF. • Provide financial and material assistance to the individuals to meet the needs of medical care relating to major surgery, cardiac problems, cancer, liver diseases, brain hemorrhage, paralysis etc. A committee consisting of four members headed by the Managing Director of PKSF operates the fund. The committee considers the applications and takes appropriate action. Since 2010, PKSF has disbursed around BDT 1.35 crore in total as financial assistance to education, health and other social services sectors from its Special Fund. Grant of a scholarship BDT 4,500 per quarter to Ms. Ishita Saha, an ultra poor student of Government Mujib College in Noakhali district and the scholarship will be continued till 2018. Contribution of BDT 1,00,000 to Mr. Nazrul Islam, an employee of “Uddipan”, a Partner Organization, for the treatment of his casualty caused by road accident. BDT 3,00,000 as grant to Ms. Bithi Islam, a founder member of “Grameen Jano Unnayan Songstha”, a Partner Organization of PKSF, for the treatment of cancer. BDT 1,00,000 to Mr. Badiul Alam, a helpless person, for treatment of brain injury. BDT 50,000 to Mr. Khurshid Alam, a destitute person, for treatment of his spinal cord. BDT 1,00,000 to Mr. Akther Hossain, a part time data entry Operator of PKSF, for the treatment of retinal detachment of his eyes. 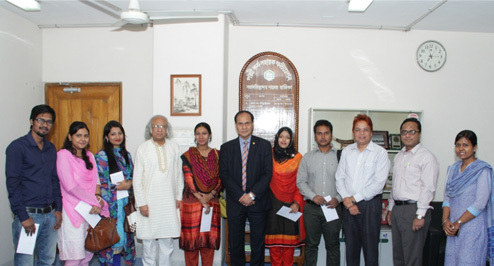 Grant of BDT 1,20,000 is given to 6 students of Dhaka School of Economics as scholarshipfor completion of their research activities.